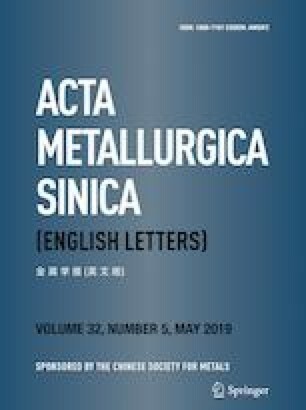 Effect of aging heat treatment on the grain boundary microstructure and creep properties of a cast Ni-based superalloy was investigated. With increasing aging temperature from 750 to 1000 °C, M23C6 carbides along the grain boundaries evolve from fine distributed block, continuous film into the coarse discrete block. Moreover, the M23C6 carbides are mainly enveloped within γ′ layers along grain boundaries during 1000 °C aging. Creep rupture lifetime and elongation at 760 °C and 645 MPa are improved with increasing the aging temperature. In particular, the creep rupture lifetime of the specimens aging at 1000 °C is one order of magnitude higher than that of the specimens aging at 750 °C. The enhancement of ductility induced by the γ′ envelopes plays a significant role in the improvement of creep rupture lifetime. The work was financially supported by the National Key Research and Development Program of China (No. 2016YFB0701403) and the National Natural Science Foundation of China (Nos. 51701220, 51631008, 51671196 and 51871210).